Lions Jim Scala and Wayne Bent and volunteer Sam Baker served 182 guests at Westport Lions Club very successful fish fry on June 17th. 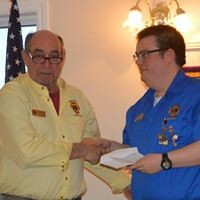 The Westport Lions Club opened their first meeting of the month with a hardy rendition of Happy Birthday to Lion Bill Garland. 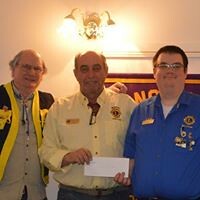 Lion Jim Scala recognized the effort and thanked Lions Don Baker and Dwain Smith for their outstanding work for cleaning the basement after the flooding, and getting the property in shape after the high water levels. Their commitment to maintaining the property is greatly appreciated and beyond the call of duty. The Mobility Van Fund received a large donation in memory of Margret McGregor and Mr. Diotte, as well as a thank you note from Bonnie Bilton. These gestures are always welcome. The Club pasted motions to hire C/W Roofing to install rain gutter screens, and Charles Norward to clean up the trees on the property for safety. We also passed a motion to integrate the sale of Christmas cakes with our existing gift program. It is hoped that the sales will help to recover some of the cost of giving out Christmas cakes to seniors. In the past, people have often asked if they could buy an extra cake so we thought we would try it in 2017 on a limited and trial basis. In the old business section of the meeting, Lion Michael Harris presented his proposal for selling of Christmas cakes. David Blair volunteered to represent the club at RDHS graduation ceremony. Chairpersons Rick Warriner organized volunteers and worked out the details for the fish fry, and Marty Hawkins for the canteen at Heritage Day. 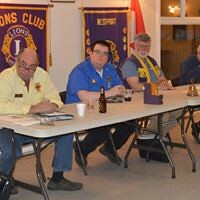 Lion Bill Garland encouraged members to continue to sell tickets for our annual cash draw being drawn at Rideau Vista Public School on July the 1st. First prize is $1500 cash, with a second prize of $250. The proceeds from this draw will go directly to maintaining our beach programs. You can purchase tickets from any Lions member. Also look for our tables in front Kudrinko’s, the post office, and at Heritage and Canada Day. In the new business part of the meeting, Lion Jim Scala volunteered to update all of our plaques. Awards Night will be postponed until Wed., July 12th due to a large number of members not being able to attend the June 28th meeting. Plans were made for Canada Day and operating a bar for Rideau Thunder on July 8th. Lioness Heather Huth gave out certificates of appreciation from the Library Board to members living outside of Westport to allow them to use the library free of charge. 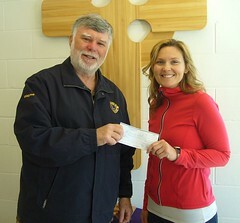 This gesture was in recognition of the money donated and raised by the Westport Lions Club for the Westport Library.